Four-color process printed on Side 1 of 14pt C1S White Semi-Gloss stock. Coated with Aqueous Gloss. H1 business card slits on right pocket. 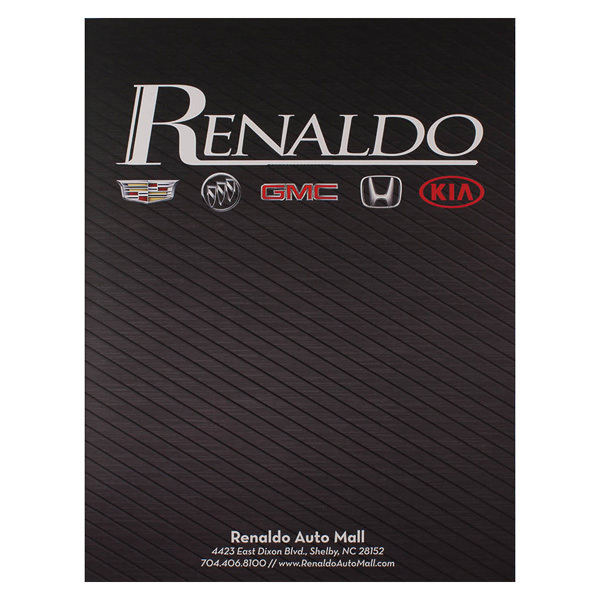 Slanted lines on Renaldo Auto Mall's black panels look textured. The car dealer's name sits above logos for the five brands it sells. Contact information at the bottom lets customers visit, call, or browse online. Two black pockets carry the cover's sleek style over to the interior. On the back, the five logos reappear to remind car buyers of Renaldo's selection. Four-color process printed on Side 1 of 12pt C1S White Semi-Gloss stock. Coated with Aqueous Gloss. H1 business card slits on right pocket. 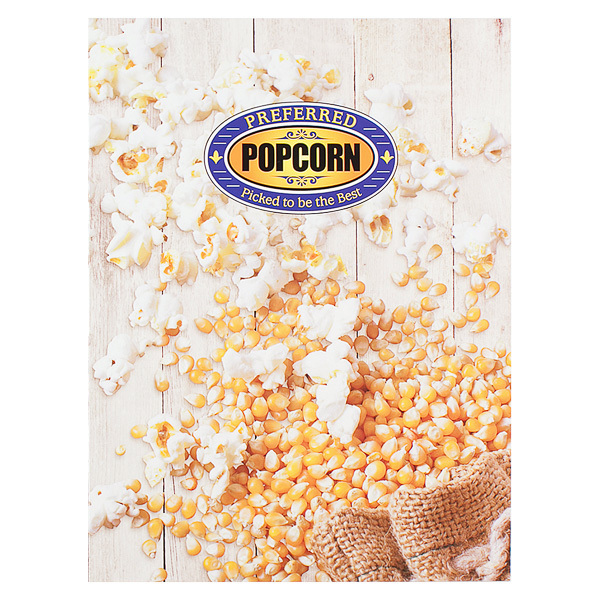 This folder for Preferred Popcorn features a bag of corn kernels spilling out on a wooden crate. Perfectly popped popcorn is mixed with the kernels in a photo that wraps around both outer covers. The purple and gold logo is the color of royalty, exemplifying the company slogan: “Picked to be the Best.” Purple pockets carry the color scheme to the interior, while the back cover features locations and contact info to help clients quell their popcorn cravings. Four-color process printed on Side 1 of 12pt C1S Semi-Gloss stock. Coated with Aqueous Gloss. H1 business card slits on right pocket. Designed to look like mini color swatches, Inhance It! 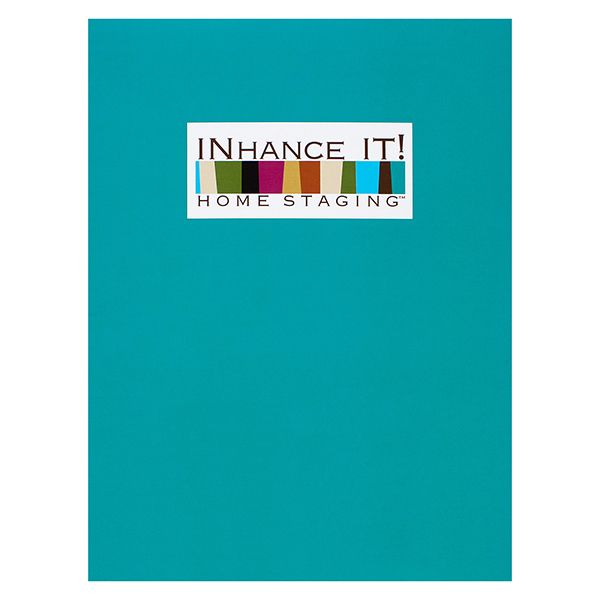 Home Staging's logo alludes to classy, creative décor. A deep turquoise background is the perfect combination of modern, cool, and collected for the brand, which helps sellers "stage" their homes to appeal to potential buyers. The colorful logo makes a cameo appearance on the interior, where it covers both pockets for a bright pop of color on the white panels. Nestled in the Hudson Valley, Ashford Estates at Chester promotes its 19-home community with a taste of nature. 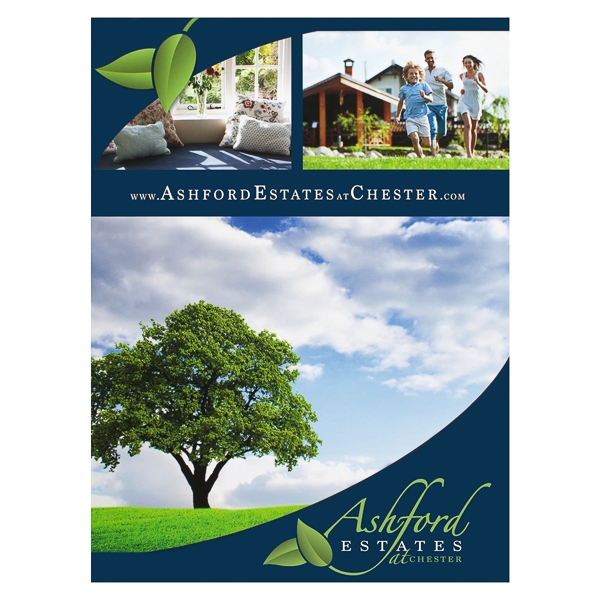 The sunlit cover photos are cropped in the shape of a leaf, matching the Ashford logo. A professional navy border and pockets complement the vibrant, personable green accents. On the back cover, buyers can learn more about the community and surrounding areas, thanks to the two maps of nearby attractions. Don't let looming deadlines keep you from getting what you want. This classic design fits into busy schedules and budgets. It requires a 24-hour production time after final proof approval; orders finalized before 11 a.m. EST ship the next business day. Besides being cost-effective, it retains all the quality of a weeks-long design project. Your order will arrive looking great and ready to hold 8 1/2" x 11" print materials in its two v-split pockets. Square corners add a modern, stylish look that will impress the crowd. Left Pocket: 4" v-split. Glued at outside edge. Right Pocket: 4" v-split. Glued at outside edge.